Let's say you are living in a country like North Korea and one day you wake up and you say to yourself that you have had enough of this Kim Jong-un dictator. This is the day when you and your neighbors are going to take charge and once for all end the dictatorship that's destroying your country. The big question now is: What's the next step? How do you actually overthrow a dictator? The man who has the answer to your questions is Gene Sharp. Gene Sharp was born in the US in 1928. He has always been a man of peace, so when he protested against the conscription of soldiers to the Korean War, he ended up in jail. He now faced a prison sentence that should have lasted 14 years. Before ending up in prison, he had begun to write a book about Mahatma Gandhi, another man of peace who contributed to the non-violent liberation of India from the British Empire. Gene Sharp asked no-one else than Albert Einstein if Einstein could write the foreword to his book about Mahatma Gandhi. Albert Einstein accepted, and using his connections with Albert Einstein, Gene Sharp had to spend only 2 years in prison. Gene Sharp would later found the Albert Einstein Institution - a non-profit organization advancing the study and use of strategic non-violent action in conflicts throughout the world. The video at the top features Jamila Raqib, who's working at the institute. 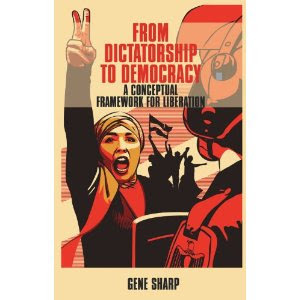 There's also a documentary about Gene Sharp: How to start a revolution? if you are interested in learning more about him and his work. Gene Sharp has written several books on the subject of non-violence. The most famous book is "From Dictatorship to Democracy - A Conceptual Framework for Liberation". If you ever need a manual on how to overthrow dictatorship - this is the book you should read. The book is available for free here and it's available in 27 languages. The book has spread around the world and did probably inspire the recent uprisings in the Middle East known as the Arab Spring. We know that the methods from the book were used in Serbia to successfully overthrow the dictator Slobodan Milosevic. From Dictatorship to Democracy focus on how to destroy a dictatorship and how to prevent the rise of a new dictatorship. Destroying a dictatorship will never be an easy or a cost-free endeavor. Fighting dictators will bring casualties, but these casualties can be minimized if you use the findings from the book. As of 2008, 34 percent of the world's population lived in countries with extremely restricted political rights and civil liberties. Non-violent struggle could help these people as it helped the people when overthrowing dictatorships in Estonia, Poland, East Germany, Slovenia, Bolivia, and many other countries. We don't know for how long these non-violent struggles will last before the dictator falls, some took years while other struggles only took a few days. In the end, liberation from dictatorships has to ultimately depend on the people's ability to liberate themselves. To get to this point, the first step is to understand the relationship between the people and the dictator. Dictators require the assistance of the people they rule, without which they cannot secure and maintain the power. If a dictatorship depends on the cooperation of people and institutions, then all you have to do is shrink that support. A dictatorship may appear to be strong - and the opposition may appear to be weak. But in reality, all dictatorships have some sort of weakness, such as personal rivalries and internal conflicts. These weaknesses tend to make the regime more vulnerable to resistance. Target these weaknesses and your revolution will have a greater chance of success. Selective use of various types of strikes - what happens if you stop the delivery of petrol? If we return to North Korea, we know that it is up to the people in the country to solve their own problem, as we learned in the previous post: The impossible peace between South Korea and North Korea. South Korea doesn't want to be re-united with North Korea because of the costs involved.